Why See Lyric Opera - Anna Netrebko? Often likened to the next Maria Callas, it's hard to believe Russian Austrian operatic soprano Anna Netrebko had a life before opera, let alone a job that included scrubbing the floors at St. Petersburg's renowned Marrinksy Theatre. After winning the first prize in the prestigious Mikhail Glinka competition in 1993, the extraordinary diva began her descent into the upper echelons of opera, becoming one of the world's most in demand performers thanks to her dark yet lustrous voice, alluring stage presence and emotive characterisations. Accompanied by frequent collaborator and highly regarded pianist Malcolm Martineau, the resplendent songstress comes to Chicago's Lyric Opera for a rare showcase of show-stopping favorites from her far-reaching repertoire. From the virtuosic climes of Tchaikovsky to Wagner, Netrebko has performed in some of opera's most coveted and cherished roles, including Puccini's Mimi, Mozart's Suzanna and Donizetti's Norina. Sound good to you? 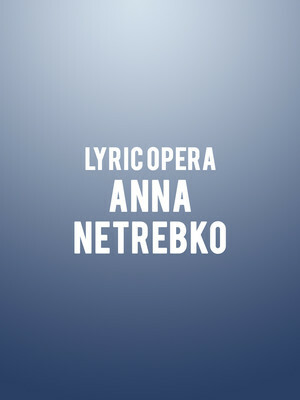 Share this page on social media and let your friends know about Lyric Opera - Anna Netrebko at Civic Opera House. Please note: The term Civic Opera House and/or Lyric Opera - Anna Netrebko as well as all associated graphics, logos, and/or other trademarks, tradenames or copyrights are the property of the Civic Opera House and/or Lyric Opera - Anna Netrebko and are used herein for factual descriptive purposes only. We are in no way associated with or authorized by the Civic Opera House and/or Lyric Opera - Anna Netrebko and neither that entity nor any of its affiliates have licensed or endorsed us to sell tickets, goods and or services in conjunction with their events.